EXCEPTION - Do not capitalize titles that follow names. EXCEPTION - Do not capitalize titles used as general words. Capitalize very high ranking government officials' titles even when not followed by a name or used in direct address when a specific individual is referred to. If no specific individual is referred to, do not capitalize titles of even very high ranking government officials. Capitalize important words in compound titles used with names, but do not capitalize prefixes or suffixes added to the titles. 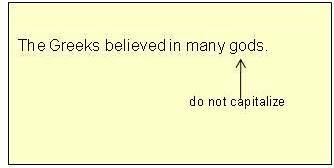 EXCEPTION - Do not capitalize the non-specific use of the word "god." 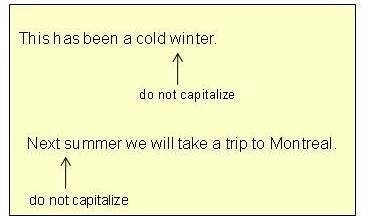 EXCEPTION - Do not capitalize the names of seasons if they are used generally. EXCEPTION - Do not capitalize the first word of a list following a colon if the list is not a complete sentence. 15. the single-letter word, first person pronoun I. NOTE - Experts disagree about whether to capitalize earth, sun, and moon. For consistency, this author suggests capitalizing them when they are used to designate celestial bodies.